On June 25, 2018, Pittsburghers for Public Transit and the Mon Valley Initiative launched the Riders’ Vision for Public Transit. We have won a number of victories in recent months, restoring and preserving bus service in communities that need access to public transit the most. 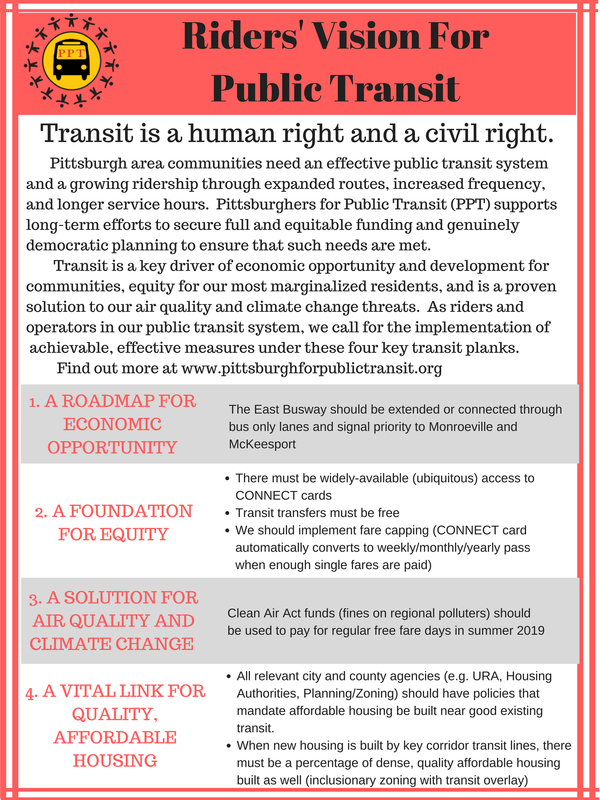 However, we know that these are only first steps to achieving a truly equitable and growing transit system in Allegheny County. Transit is a critical component for economic development and opportunity, for equity, for becoming a truly sustainable and climate resilient city, and is a necessary partner for affordable housing. Bus leaders on the BRT and 59 campaigns are proposing a series of key, achievable regional transit goals to highlight and serve each of these four planks. Join us! Sign up above to take part in any of the four planks of the Riders’ Transit Vision: Transit as A Roadmap for Economic Opportunity, A Foundation for Equity, A Solution for Air Quality and Climate Change, and A Vital Link for Quality, Affordable Housing.